Project led by: Project led by Paul Stone, NZ. My Role: My role as a senior communications designer and advisor included developing a stakeholder engagement plan (for both internal and external stakeholders) through the scoping, build and implementation of the project. Generating visual material for launch, engaging and briefing suppliers for audio-visual material collateral. Preparing full range of print collateral for launch activities. Targeted engagement with private and public sector stakeholders to generate interest in the project; establishing ongoing relationships on behalf of the Commission and project team. Internal liaison with senior managers, CE and Ministers office including preparation of briefing materials. 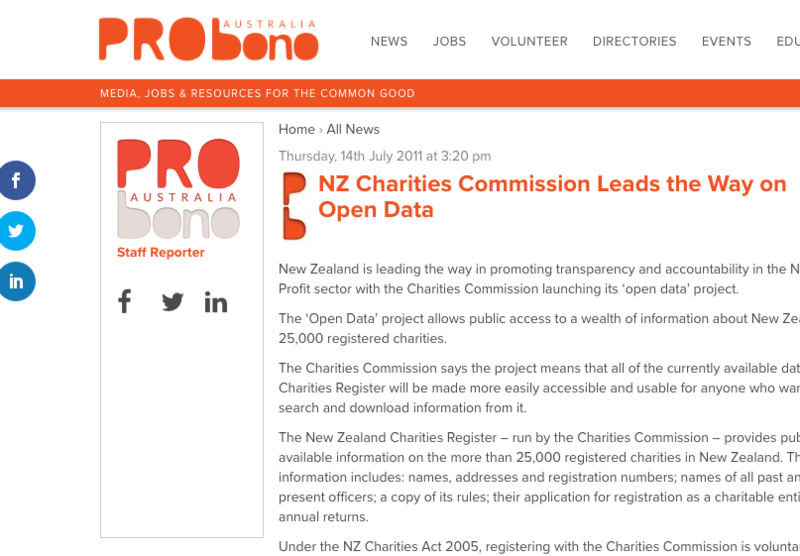 The Charities Commission registers New Zealand charities and collects their annual returns which are searchable by members of the public. Charities were one of the first New Zealand government agencies to consider opening up their API to software developers so that this useful information could be made to be more accessible and used in a wider variety of ways, by the public. 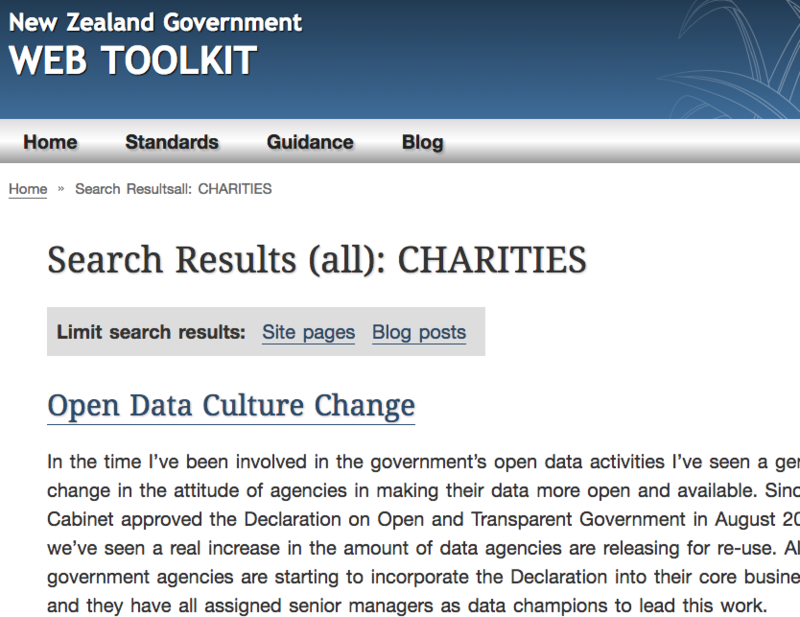 Delivered Solution: The Open Data project for Charities New Zealand successfully implemented to international recognition. The result can be read about here. Process Highlights: Researching global practices for public sector Open Data, using overseas examples and best practice to turn ‘opening an API’ into meaningful stories that could engage and inspire staff, governance representatives and IT stakeholders. We also engaged local Open Data lobby groups by inviting them in to discuss an early prototype. I drafted and designed all communications collateral for all audiences.